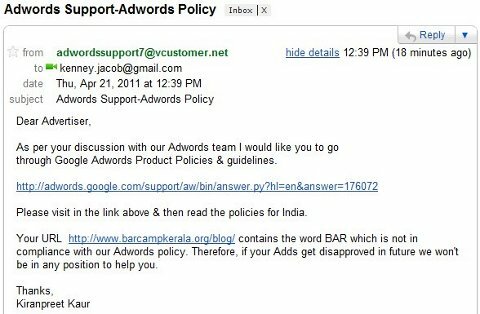 Google Adwords disapproved an ad about BarCamp saying, they don’t allow ads related to liquor! Kenney Jacob shared this on BarCamp Kerala Group today. Yesterday I got a very funny call from Google. 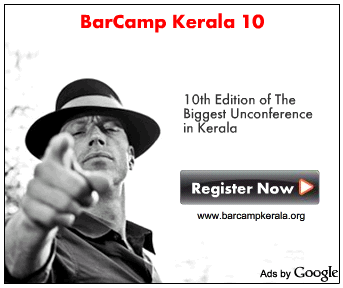 I had created an advertisement for the event BarCamp Kerala 10 using google adwords and was waiting for approval. This lady calls me up and apologized saying that they cannot approve the ad saying that they have a policy against ads related to liquor. I tried talking some sense into her explaining the about the event asking her to ‘google’ about it etc. But she refused, she demanded that the only way to get the ad running is to change the name and the url. Can you believe this, a company as reputed as google making such stupid stand on an event which is conducted all over the world. VCustomer is Google AdWords partner in India, working on behalf of Google to help advertisers. This entry was posted on Thursday, April 21st, 2011 at 6:47 pm and modified by WebMaster View at 6:55 pm. You can follow any responses to this entry through the RSS 2.0 feed. Responses are currently closed, but you can trackback from your own site. Dumb!! Really surprised that they recruit such dumb people.. Maybe the ill effects of hiring a whole class of students at one go?? LOL..